It’s a challenging period for online publishers thanks to low advertising rates, and that’s leading to some moves towards emphasizing subscriber-only content and packaging those subscriptions differently. A subscriber model is working very well for The Athletic, which just brought in another $40 million, and newspapers have tried a few different approaches to boost that model as well, from digital-only subscriptions at many papers to sports-only subscriptions (currently offered at The Miami Herald and The Kansas City Star, contemplated at The Washington Post and elsewhere). …Verizon Media Group/Oath houses many smaller brands that have niche audiences, like TechCrunch, Engadget and Yahoo Sports. TechCrunch currently leverages its deep relationship with tech wonks to monetize big conferences. Yahoo Sports does the same thing with fantasy sports. While it’s debatable if Yahoo Sports is a “smaller” brand or has a “niche” audience (the percentage of the North American world interested in sports is a pretty big niche, and Yahoo Sports and TechCrunch are both more well-known to many than Yahoo Finance), it’s certainly interesting to hear this discussion. 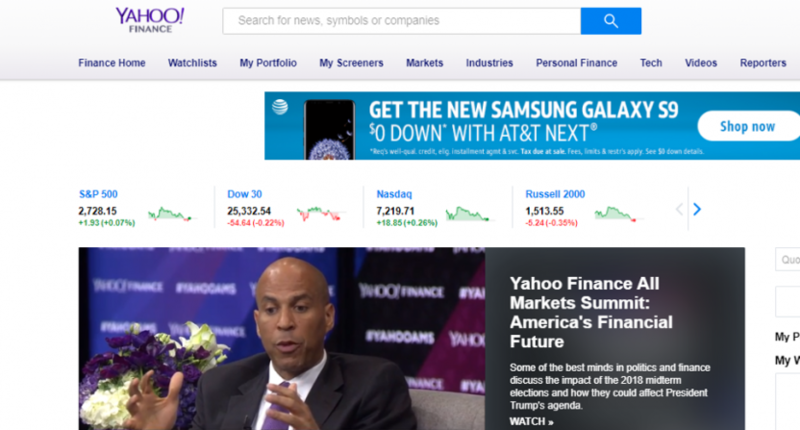 It’s especially notable considering that it’s a change from Yahoo’s past strategies. The company has long been focused on advertising-supported content in sports (but also overall), making money from the audience for their stories (especially those that get the traffic firehose of being featured on the Yahoo.com homepage, or the similar homepage in other countries) and from the use of their apps (for scores, news, and especially fantasy), with the key goal of maximizing reach to get the largest possible audience for those stories and apps. So a shift towards premium content with subscriber fees would be a big change. There are some moves Yahoo has already made that might help if they do make a shift in sports. As Yahoo Sports GM Geoff Reiss told AA back in September, they’ve made a big push into regular video shows, from daily morning recap show The Rush to Mostly Football with Martellus Bennett to The Spin (focused on spotlighting Yahoo’s journalists). At the moment, those shows have significant reach thanks to Yahoo’s audience and thanks to how they’re featured in the app (and that app’s gaining even more prominence due to Yahoo’s streaming of NFL games without authentication requirements), and offering those on an ad-supported basis to a large group of users seems to work for now. But if Yahoo Sports does shift towards subscription content, some of that video content might be something that winds up there. That’s an approach Sports Illustrated is trying with SI TV. (It’s notable that Yahoo Finance has also been doing regular video shows and hosting premium conferences, both areas that could be further featured with this move.) And while that NFL streaming is currently free, most other ways to watch the NFL involve payment in one way or another; it’s certainly possible that the NFL content moves to a premium sports option if Yahoo launches one. A premium sports option might also increase the case for Yahoo to buy other sports streaming rights and put them there. It’s also possible that this shift is only seen at Yahoo Finance, though. Business news is generally seen as one of the easier areas to charge a subscription fee, often with a harder (no free articles a month, or only a few) paywall than general news. Several reasons contribute to that; one is that business news isn’t read as much by a wide audience as general news (so it’s harder to make it work on an ad-supported basis), while another is that there are less outlets covering business news in-depth (so you’re less likely to find a particular story elsewhere for free), and a third is that it’s often businesses instead of individuals paying for subscriptions (and that they’re often willing to pay if there’s actionable information they can get from the news). In any case, it’s certainly interesting to see Yahoo Finance launching a subscription service. And it sounds like there may be more moves on that front ahead for that company, as Verizon Media Group CEO K. Guru Gowrappan told Fischer “The launch of Yahoo Finance Premium is one example of the membership opportunities ahead for us as we focus on creating services that provide value to our consumers and advertisers, including subscription, transactions and commerce that are uniquely authentic to each brand.” We’ll see how this launch goes, and if sports indeed proves to be one of those “membership opportunities” they explore down the road.